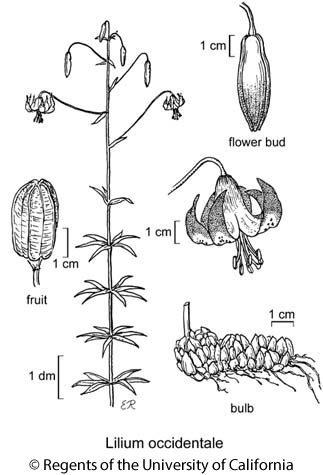 Habit: Plant < 2.2 m; bulb spreading-elongate, unbranched, scales 1--2(3)-segmented, longest 0.9--2.5 cm. Leaf: in 1--9 whorls (alternate), 4--27 cm, +- linear or not; margin not wavy. Inflorescence: flowers 1--13(35), pendent. Flower: +- widely bell-shaped, not fragrant; perianth parts 4.3--8.1 cm, reflexed in distal 60%, +- 2-toned, adaxially red to maroon (orange) on distal 50--60%, base yellow to green, with a band of orange or yellow between or not, abaxially strongly green on basal 40--50%; filaments +- parallel, anthers 5--14 mm, dull red or magenta, pollen generally red-brown (+- orange); pistil 3--5.5 cm. Fruit: 2.1--5.4 cm. Ecology: Coastal scrub or prairie, gaps in conifer forest; Elevation: < 100 m. Bioregional Distribution: n NCo (near Crescent City, Del Norte Co.; Humboldt Bay, Humboldt Co.); Distribution Outside California: southwestern Oregon. Flowering Time: Jun--Aug Note: In disjunct colonies. Central green star of +- all perianths ages yellow or yellow-orange. Threatened by habitat loss, grazing, competition, collecting. Citation for this treatment: Mark W. Skinner 2012, Lilium occidentale, in Jepson Flora Project (eds.) Jepson eFlora, http://ucjeps.berkeley.edu/eflora/eflora_display.php?tid=30948, accessed on April 25, 2019.
n NCo (near Crescent City, Del Norte Co.; Humboldt Bay, Humboldt Co.); Markers link to CCH specimen records. Yellow markers indicate records that may provide evidence for eFlora range revision or may have georeferencing or identification issues. Purple markers indicate specimens collected from a garden, greenhouse, or other non-wild location.